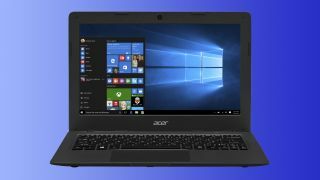 Chromebooks eat your hearts out; Acer has introduced a new pair of Cloud-connected Windows 10 laptops with its Aspire One Cloudbook series. Like Chromebook, Acer's new Aspire One Cloudbooks come equipped with a modicum of power split between an Intel Celeron processor, 2GB of RAM and only 32GB of SSD storage to start. But what these 11- or 14-inch laptops lack in local resources, they more than make up with Cloud services. Every Aspire One Cloudbook comes with a free one-year subscription to Microsoft Office 365 and 1TB of OneDrive online storage. Acer also includes a full suite of Cloud-enabled abApps for editing photos, drafting documents, organizing files and creating music. Thanks to the low-powered nature of the Cloudbooks, Acer was able to go with a thin, fanless design. The 11-inch model, for instance, only measures 0.70 inches (17.9mm) thin and weighs 2.54 pounds (1.15 kg). Meanwhile, the 14-inch version tips the scales at 3.5 pounds (1.6 kg). Both Cloudbooks also feature 802.11ac wireless technology to keep up with fast connection speeds and they can be upgraded with up to 64GB of eMMC storage. The only thing that's truly lacking is the 1,366 x 768 resolution display, which can't be upgraded on either the 11- or 14-inch models. The Aspire One Cloudbook 11 will be available later this month with prices starting at $169 (about £108, AU$232). Following in September the Aspire One Cloudbook 14 will launch for an introductory price of $199 (about £127, AU$273).